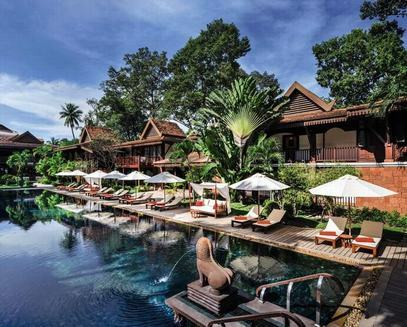 Belmond La Residence D’Angkor, Cambodia, is part of the Belmond (former Orient-Express) collection of hotels. It is located by the river in the centre of Siem Reap, ideally placed to explore the breathtaking complexes of Angkor Wat and Angkor Thom, or indulge in the thriving markets of Siem Reap. Surrounded by majestic ancient trees and built in traditional Khmer style , this intimate retreat’s quiet gardens, swimming pool and spa are the perfect place to relax at the end of a thrilling day. The hotel has 50 Junior Suites and 9 Deluxe Studio Suites exquisitely decorated in soft cottons, jewel-toned silks, traditional hardwoods, bamboo, and light, airy, floor-to-ceiling windows. The hotel features a gastronomic restaurant called Circle which offers to the guests a delightful cuisine with international and khmer dishes with a contemporary twist. The restaurant also offers an Apsara dance show 3 times per week. La Residence d’Angkor is one of the famous hotels of Belmond in South-East Asia. Located just few minutes walk to the Old market, along the river, this is one of the most charming places in Siem Reap. The traditional design and decor are perfectly mixed with the modern facilities of a 5* hotel, for the comfort of guests.